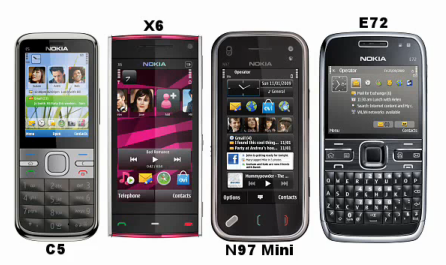 After N Series, E Series and X Series , Nokia recently announced the upcoming availability of Nokia C series smartphones. The first C series phone hitting the market will be the Nokia C5. 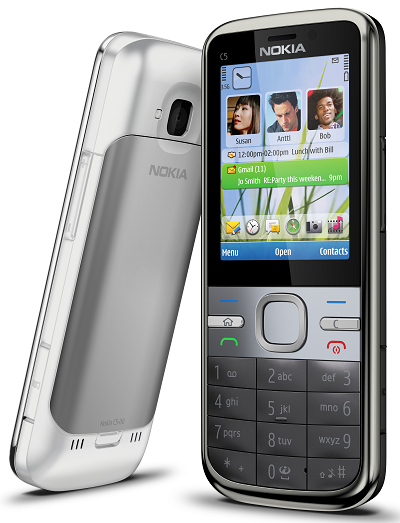 The Nokia C5 is just another S60 V3 handset with average hardware. The C series handsets are believed to be a part of Nokia Core range. The naming is also explained as Nokia’s new strategy. All future Nokia phones will be named with one English letter followed by a single number. This type of naming will help customers to understand the series of phone to which it belongs and the average level of features it might have. We can see similar naming convention Nokia Entertainment series X3 and X6. However, the surprising fact is that we can only have around 250 phones by this method. Anyways Nokia C5 is a mid rage phone in C series. It has a very impressive lightweight design with stainless steel finish. As we said earlier Nokia C5 is a conventional non touch S60 V3 handset with extra more looks. The device gives more importance to social media and networking. Inbuilt applications like Nokia messaging supports IM over Google Talk and Windows Live. The home screen inn Nokia C5 has the option to set favorite contacts with images. Each contacts open their details along with latest updates from Facebook. Apart front VGA camera, there is a standard 3.15 MP camera with LED flash and auto focus. Another attraction of Nokia C5 is its long lasting 1050 mAh battery. It has GPS with free navigation license on Nokia OVI maps, but no WiFi. Overall the new Nokia C Series C 5 is a slim handset with clean looks, lower price and great social connectivity. 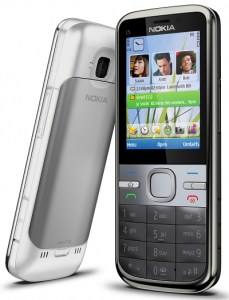 Nokia C 5 is quad band GSM phone that also supports dual band 3G. 2.2 inches TFT display with 16 million color support and 240 x 320 pixels resolution. C 5 has standard features like Bluetooth with A2DP, FM radio with RDS, web browser, music player, document viewer, photo editor, social media applications etc. 50 MB internal memory and 128MB RAM. Memory card slot to expand storage up to 16GB, 2Gb included. Powerful ARM 11 600mHZ processor. Nokia will launch the C5 on second quarter of 2010. The price of Nokia C5 will be around 190USD in US and 8500 INR in India. I want to buy c5. When it will in chennai?what’s the price? I am very eager to buy C5. When can I get it in Chennai. I am very eager to buy C5. Is it a Dual Sim Phone? Thank you. Let me know the Browser Version. If it is above 5.0. Then it is OK, so that I can access my Bank Account. I will wait upto June 2010 to buy it. wht’s its price till date in INR.